No Impact – Just Muscle Exercise! 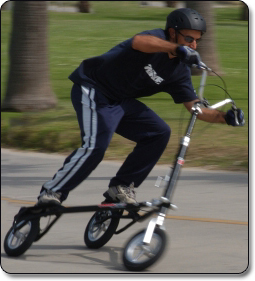 Most Trikke owners are in their 40s, 50's, 60's and some youngsters in their 70's. The Trikke is also extremely popular with the younger generation. The fun, comfort and security of the Trikke has people of all ages enjoying the outdoors. Running is high impact on your joints, walking is just too slow, inline skating can be hazardous. The Trikke is the medium between walking and running but with no impact – just muscle exercise. Go longer distances to get that extended workout without over exerting. Inline skating (roller blading) only has 2 points on the ground which makes you vulnerable. The Trikke and it's 3 point stance gives you the comfort, security and stability that most prefer. You'll also burn 100's of calories and tone your muscles while getting a good cardio-pulmonary workout that is so important to your daily health. You'll also enjoy more scenery! Carving for 5 to 10 miles is very common on the Trikke. You'll intrigue people and turn their heads. Get on a Trikke today and see for yourself how FUN the FITNESS MACHINE can be! Want to compare calorie consumption among other activities? Trikke has a model for every age and size to help your family rediscover the fun and enjoyments of riding together. Whether you have miles of beach front boardwalks or just your own driveway, it's fun to ride even in the tightest of quarters. So mom and dad can jump on and join in the fun for a riot of a time with your kids.